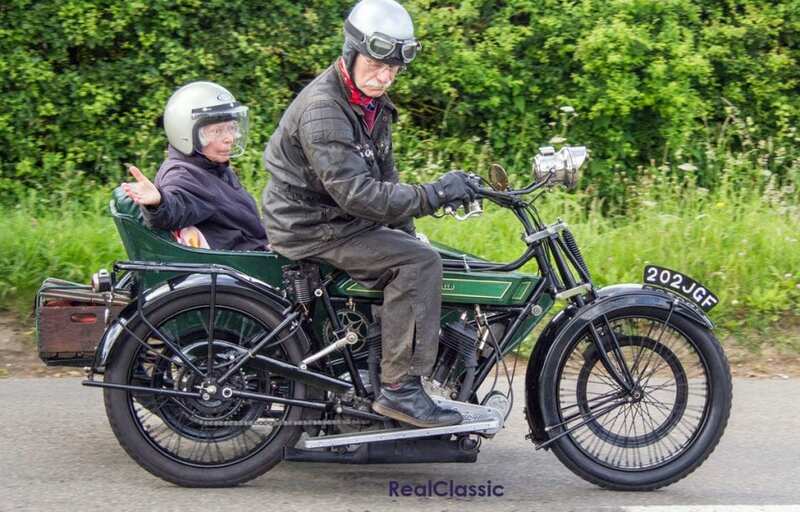 The Sunbeam Motor Cycle Club is dedicated to bikes built before 1940 – and many of these magnificent machines are regularly ridden. Richard Jones found some real rarities at last month’s Rose of the Shires run. As you can see, there isn’t a better venue than Stoke Bruerne for this type of event, particularly when the sun is shining. As the SMCC’s cut-off date for eligible machines is the 31st December 1939 it provides an excellent opportunity to see – and photograph – some interesting older machines. 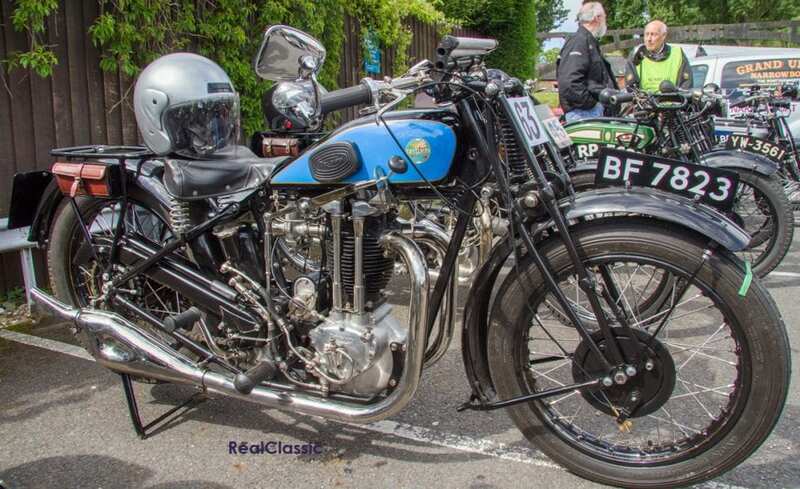 These are generally motorcycles from the UK but this year also saw some vintage bikes which hailed from further afield. 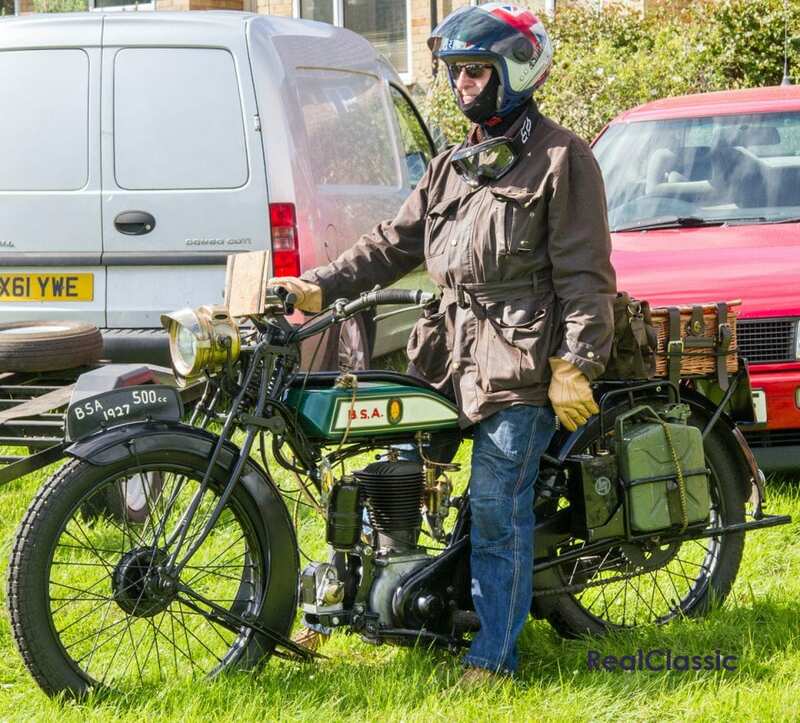 Zut alors – here was a Leon Bollée from 1900 gracing the roads of Northants and it was a pleasant surprise to see such an early machine taking part. Monsieur Bollée first produced his prototype voiturette, a 3hp, three-wheel tandem with a belt drive, at Le Mans in 1896. Thereafter the machines were manufactured by Hurtu & Diligeon and they sold well with several hundred being built. In 1899 the marque went over to the dark side by adding an additional wheel and moved on to manufacturing cars, until 1924 when Leon Bollée was acquired by the Morris Motor Company. Production was moved across La Manche to Cowley but Morris could not make the Morris-Léon Bollée pay and the name disappeared in 1931. These machines look like they are a handful to ride (drive?) and so it helps to have someone to give signals at traffic junctions. You probably can’t see it in this photo but the petrol tank on the machine above bears the legend ‘The Campion’ – so this is not just any old Campion then. The marque began life in 1901 in Robin Hood Street located, where else, but Nottingham, and their first bike was a 2hp Minerva engined solo. This increased in size to 2¾hp in 1905 but from 1907 all went quiet until 1912 when JAP singles and V-twins were used to power a new product line. Later came Precision, Green and Villiers engines along with Sturmey-Archer and Jardine gearboxes. Engines got bigger and then smaller in the 1920s and the Campion name disappeared in 1925. 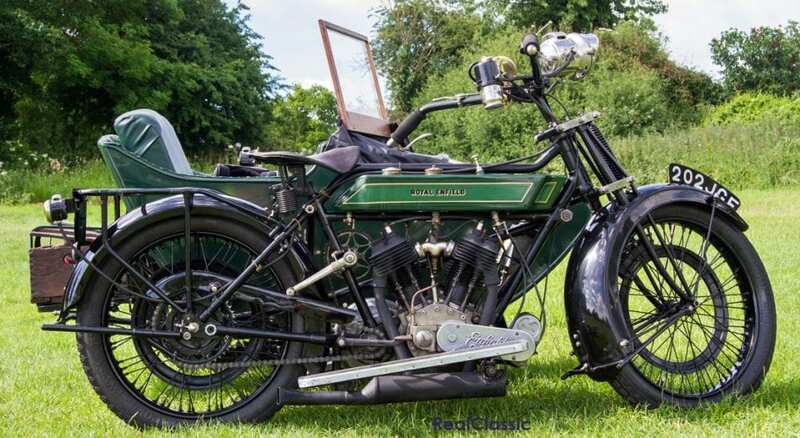 This example dates from the Campion renaissance year of 1912 and has a 500cc JAP engine with the hand gear-change being engraved with ‘Jardine Three Speed’. Handsome looking machine I think you’ll agree. 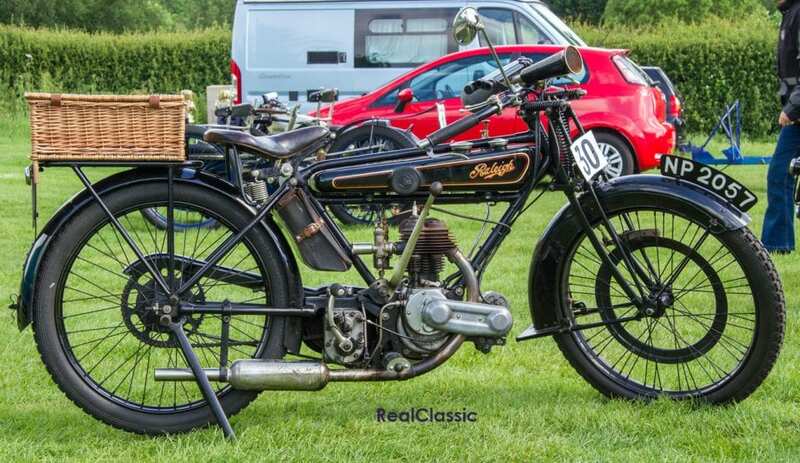 Best known for their bicycles, Raleigh also manufactured motorcycles until around 1934, and gearboxes which were marketed under the Sturmey-Archer brand – as used by Norton and Brough Superior among other marques. 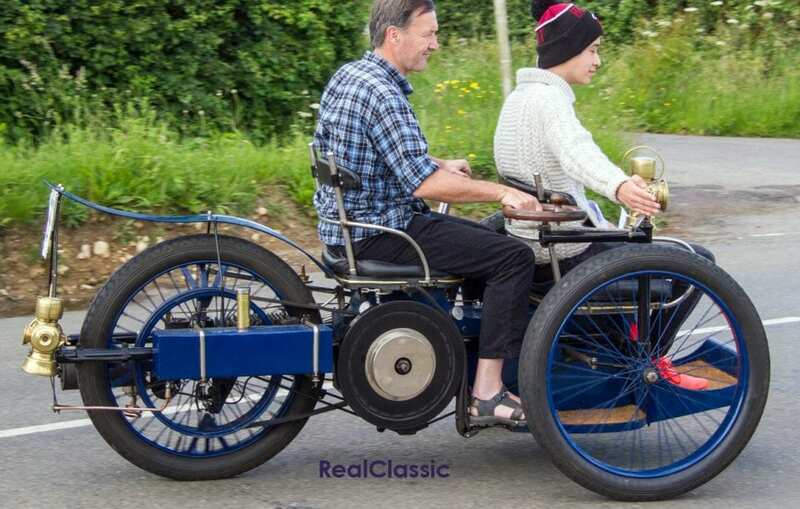 This Raleigh dates from 1923, has a 348cc sidevalve engine fed by a Brown & Barlow carburettor, and drive is transferred to that final chain drive via a Sturmey-Archer gearbox. Apparently Rex McCandless – he of featherbed frame fame – became interested in motorcycles after he was given a 348cc Raleigh by his aunt; just thought I’d throw that in. I do like the early Cottons and this 348cc JAP-engined example just slips into the SMCC fold as it was manufactured in 1939, at least that’s what the DVLA says so it must be true. Frank Willoughby Cotton applied for a patent for his triangulated motorcycle frame in July 2014 and, in his words created a ‘scientifically supreme motor-cycle masterpiece. He obviously wasn’t backward in coming forward. Benefits were said to include ‘lightness with abnormal strength’, ‘magnificent road stability’ and ‘perfect riding position.’ The Cotton was also ‘particularly suitable for lady riders’ use’. Whatever the marketeers were saying, the proof of the pudding is in the riding. Cotton won two TTs in the 1920s and a Manx GP in the 1930s so they must have been doing something right. As you might expect there were quite a few Triumphs on the run but my favourite was this new-for-1930 CTT, possibly because it has blue paintwork and I am very shallow when it comes to blue. Of course it has other attributes as befits a well-equipped deluxe model, including clean handlebars – sans wires or bolt-on bits – twist-grip throttle and magneto controls, centre-spring Webb-type girder forks and seven-inch drum brakes. The single cylinder, twin port 498cc ohv engine was equipped with Triumph’s first recirculating oil system, and power was fed through a dry, multi-plate clutch and a three-speed gearbox. The whole would have cost you about £56 17s 6d in 1930, and Triumph reckoned their new model would ‘arouse unbounded enthusiasm’ around the world. Sadly, they’d reckoned without the Wall Street crash, which meant that utility machines were rather more in vogue. There may have been other Nortons at the event but this one stole the limelight: a 1932 Model 30, aka the International, originally known as the CS1. 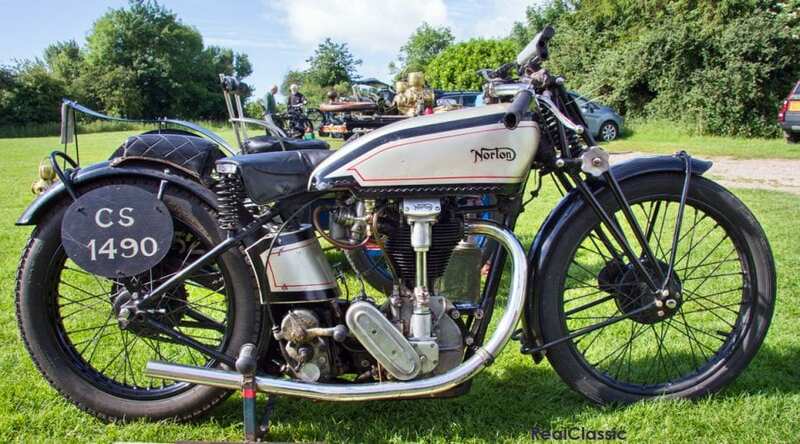 Designed in 1929 by Arthur Carroll, Norton’s chief designer, it was the marque’s second ohc engine with a shaft driven overhead cam and Norton’s trademark bore and stroke of 79mm by 100mm. This was the supersports roadster of its time, intended to be raced hard by gentlemen competitors at circuits like Brooklands, although it could be equipped with a kickstart and lights for rapid road use. 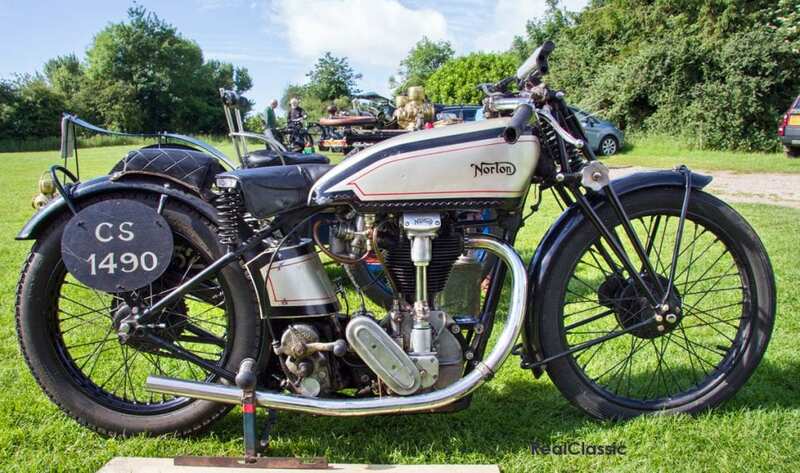 1931 saw a Norton 1-2-3 in the Senior TT with the Model 30 ridden by Percy Hunt, Jimmie Guthrie and Stanley Woods, and the Inter brought Norton racing success long into the post-war era. Let’s be honest – it looks fast here and it’s not even moving. In the 1930s, BSA made great strides with their overhead valve singles in the ‘Star’ range which spawned the Gold Star of great fame. Prior to that their sporting ohv machines were ‘Slopers’, with the engine inclined forward. And if you didn’t need that kind of performance, but instead wanted a low maintenance, low cost, workaday machine, then the S27 sidevalve 500, as seen here, was the obvious option. 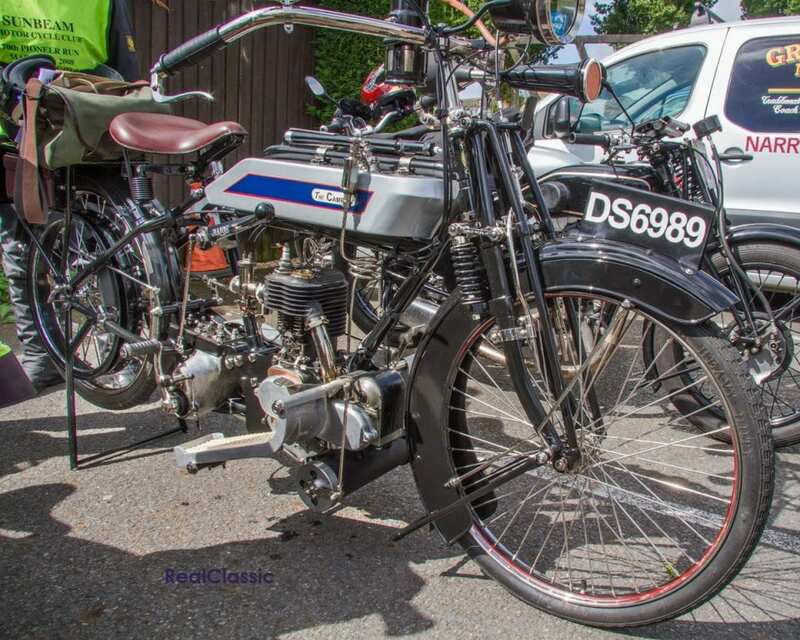 In 1927 it still used an old-fashioned flat-tank (the Slopers used the bang up to the minute saddle tanks) but was decently equipped with BSA’s own three-speed gearbox, acetylene lighting, and a Lucas magneto. 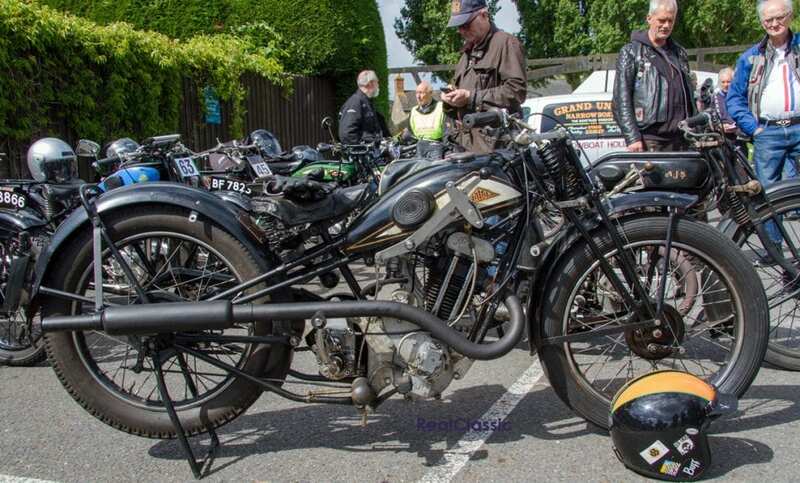 The Sunbeam Motor Cycle Club caters to motorcycles of all marques made before WW2 and hosts many events throughout the year.